These range of hills offer fantastic views of meadows and magical clouds that you can touch! Trekking on the top of hills, visiting exhilarating waterfalls and ancient temples will be the highlights of this wilderness programme. 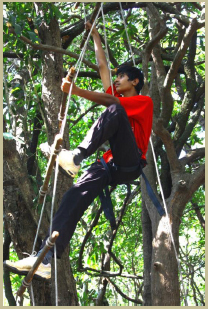 Other interesting activities will include rope activities and adventure games. Its a two-day weekend programme for all those who wish to Connect with Nature! Rs. 4000/- including food and stay at Kemmanagundi and as well as transport to the forest area and back. Only 25 participants can be accommodated.